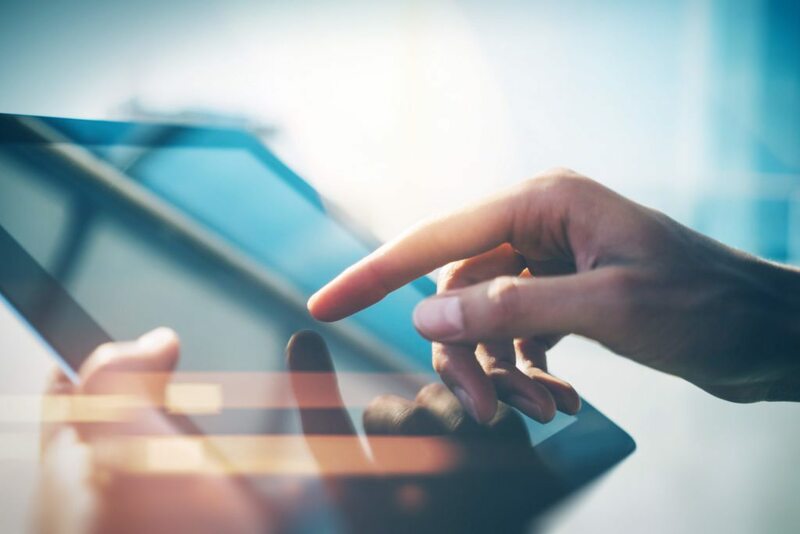 The mortgage and real estate industries have been chasing the promise of eclosings for at least 15 years — but for one technology provider, Pavaso Inc., the dream has finally become a reality. To clarify, the Plano, Texas-based company doesn’t define eclosings as simply the electronic signing of loan documents, as many mortgage technology providers do. Pavaso has created an end-to-end digital closing environment. Instead, Pavaso has created an end-to-end digital closing environment that takes a homebuyer from negotiating a sales contract with a real estate agent all the way through to the closing — and even beyond, through the entire homeownership life cycle. 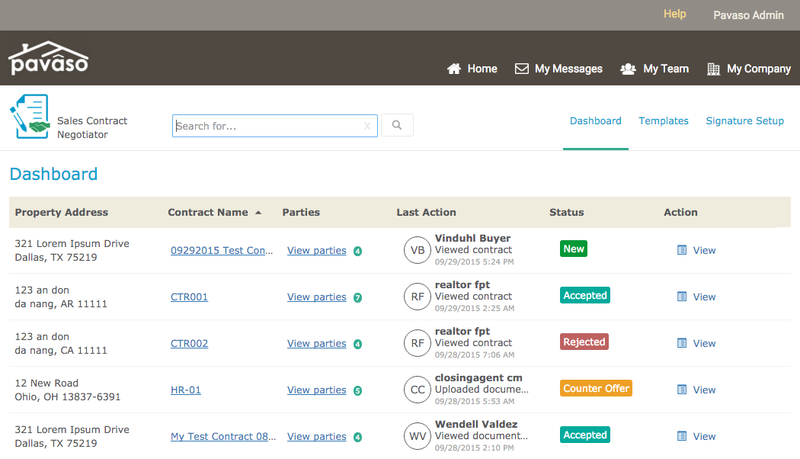 As the former president and CEO of RamQuest Inc., a technology provider for the title and settlement services industries, McElroy began testing Pavaso on six independent title companies submitting orders through RamQuest’s Closing Market software. The pilot generated profiles for all stakeholders and gave them access to all closing-related documents. But before long, it became clear to McElroy that Pavaso needed to expand functionality to gain greater adoption from real estate agents — and, most importantly, from consumers. 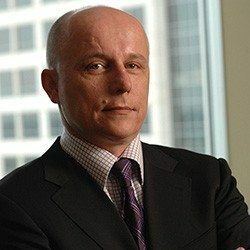 He left RamQuest in 2014 to continue work on the integration and form partnerships with various vendors to further expand Pavaso’s service network. That dovetailed nicely with the release of the Consumer Financial Protection Bureau’s (CFPB) “Know Before You Owe” consumer financial education initiative and the TILA-RESPA Integrated Disclosures (TRID) rule, which is intended to make the mortgage closing process more transparent and simpler for buyers. Pavaso also participated in two of the CFPB’s five E-Closing Pilot Programs to demonstrate to the bureau the advantages that eclosings have for both consumers and mortgage industry companies. “The CFPB has been committed to bringing eclosings to the industry,” McElroy said. “Their intentions certainly contributed to exposing the industry to the efficiencies brought about by eclosings. Then TRID allowed us to expose the industry as a whole to what really needs to happen in a closing, versus what has been happening in a closing for the last 30 to 40 years. For real estate agents, McElroy said, “the value proposition is simple. One, it gives the consumer the best possible experience they could have. Two, it gives consumer around-the-clock access to the closing. No one needs to pick up the phone or write an email. Being a mobile workforce, agents desperately need to be not at their desks, but actually showing houses. 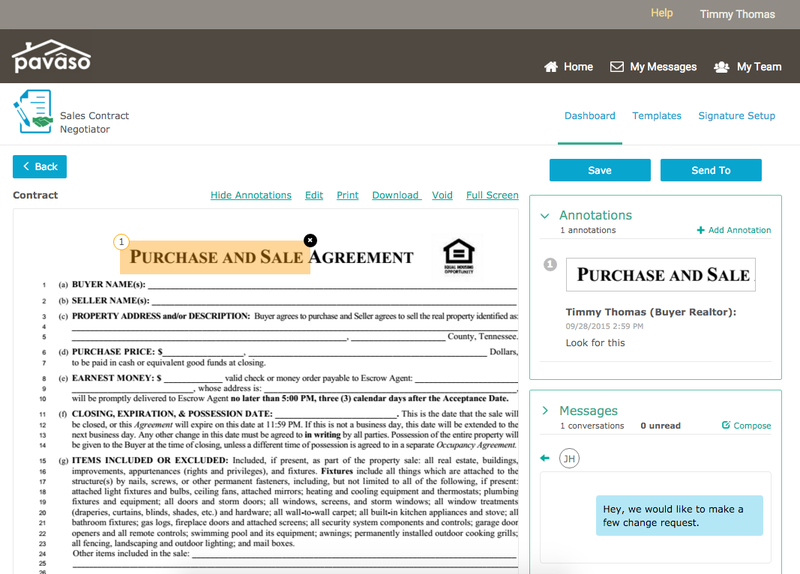 The Pavaso process begins with its Sales Contract Negotiator tool, which allows the buyer, seller and their respective real estate agents to negotiate and sign a contract online. The buyer then uses the Certified Finder app to select from a list of service providers already using the Pavaso platform, or to invite a new provider to join. 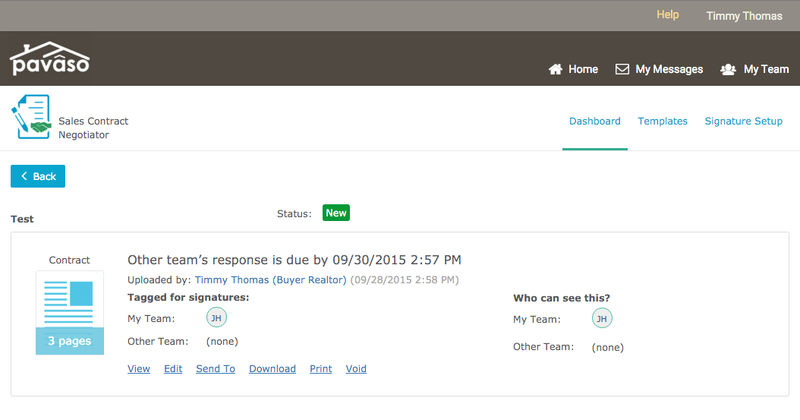 Real estate agents then submit the contract digitally. A screencap of Pavoso’s interface. The deal then begins in the Digital Close app, which produces documents within a lender’s existing loan origination system. Everyone involved in the property sale — from the real estate agent, to the lender, title company, escrow agent and, of course, the consumer — is able to securely share the documents and communicate via secure chats. Updates are sent as each stakeholder prepares for closing. Along the way, consumers are provided educational tools, definitions and explanations of key concepts and terms. Consumers can even invite non-involved parties (like their parents) to participate in the process. The platform is also available in multiple languages. “In this way, we are evolving the mortgage closing even further,” McElroy said. “We’ve all heard the horror stories of a closing where a 10-year-old boy had to translate for his parents. That’s a big exposure risk for the industry. At the closing itself, closing agents can use either Digital Close, a Web closing feature, or Signing Table app for Windows 8 touch devices. According to McElroy, because the consumer can ask questions about closing documents prior to the closing date, many closings are completed in 15 minutes or less. The platform continues to offer consumers other post-closing services they may need throughout the homeownership cycle, such as moving companies, refinance offers, insurance, credit monitoring and offers, bank offers and identity theft protection. “It seems crazy not to have this relationship with a consumer for an extended period of time, to be involved in the biggest transaction of their lives and never stay in touch or try to sell them anything else,” McElroy said. “Closings end in a celebratory fashion, instead of a consumer signing a huge stack of paper and wondering what the heck just happened.” – Mark McElroy, President and CEO of Pavaso Inc.
On the business side, Pavaso offers company branding, a secure online environment, the potential for new lines of revenue with upselling or cross-selling opportunities, error and redundancy correction, a clear electronic audit trail of the transaction’s activities and events and a way to stay in touch with buyers well after the closing. McElroy said Pavaso is similar in concept to Apple’s App Store in that it offers applications the consumer can choose from to customize their experience. There are no hardware requirements. The platform is free for consumers and real estate agents to use. Lenders and title companies are charged a per-transaction fee. McElroy said on average, the fee per transaction is about $100, and lenders usually split the charge with the title company. Realtors have been “somewhat surprised” to learn about Pavaso, “because they are preconditioned to the way things have always been done,” McElroy said.